Navarre Beach extends to Pensacola and has a lot to offer for visitors like bike, rollerblade, walk or jog the length of the island. Lots of rentals are available for jet-skis, boats, kayaks, bikes and para-sailing. There is a also a bakery on the island, 2 restaurants and a tiki beach bar. There are 2 gas and convenience stores on the island. Some of the best golf courses in the state are in the area. A Zoo for the family is also close by. If you like shopping there are several beach stores on the island or you spend a day in Pensacola,Fort Walton,or Destin. There is also a local flea market just minutes away on Hwy-98 west,open every weekend. Or get away to our miles of totally quiet and relaxing beaches on Navarre Beach. Navarre Beach is home to the longest pier on the Gulf of Mexico and we are quite the fishermans paradise. Cast a line from the pier or book a day trip for some great inshore fishing. Anglers fish the inshore waters of Navarre for Redfish, Bull Reds, Speckled Trout, Flounder, Sheepshead and more. Navarre Beach�s Pier is the longest in northwest Florida and the whole gulf coast and is perfect for reeling in the fish or just taking in the National Seashore views At 1,545 feet long and 30 feet above the water, the pier offers fun for the whole family. Visitors can rent a fishing pole at the privately operated bait & tackle shop or enjoy the breeze at the outdoor restaurant. Whether you are an experienced angler looking for world-class fishing, it�s your first time to wet a hook, or you want the perfect spot for spectacular views of the sunset, the Navarre Beach Pier is the place to be year-round. October 1st and 2nd. The Captain`s meeting on September 30 at Juana`s will kick off this signature event. Scales open on Saturday & Sunday 1-4 and more than $15,000 in prizes will be awarded at the awards presentation at Juana`s at 5:30, Sunday October 2. The mission of the Navarre Beach Marine Science Station is to promote the appreciation, conservation, and understanding of the marine ecosystem of coastal Florida through education and service. 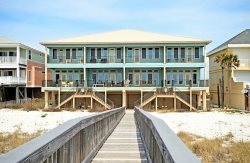 Located at the Navarre Beach Marine Park in Santa Rosa County, the center is the focal point of marine, natural resource and watershed education for Northwest Florida K-12 students, visitors, and the community. Located along one of ten National Seashores, the science center is an excellent place to learn about marine life, watersheds and the important relationships between them. Thousands of students from across Florida and the Gulf Coast come here to learn through hands-on activities from touch tanks to dolphin rescue. Families and visitors of all ages can take part, too, by registering in advance for vacation activities here. NAVARRE BEACH SEA TURTLE CONSERVATION CENTER It doesn�t have to be hatching season to get a glimpse of Florida�s sea turtles. Learn through interpretive displays, conservation volunteers and the Seamore Store gift shop. Check on events and seasonal hours here. NAVARRE BEACH MARINE SANCTUARY AND ARTIFICIAL REEFS After learning about our marine life, these three new near-shore reefs allow visitors to experience it up close. Designed for both snorkeling and diving, the park includes two reefs in Santa Rosa Sound and one in the Gulf of Mexico. Informational kiosks stand at the beach near each reef. Learn more here. Navarre Beach Marine Park is open to the public free of charge, from sun-up to sun-down daily. Located at the intersection of Gulf Boulevard and the Causeway Road in Navarre Beach. After crossing the bridge into Navarre Beach, turn left on Gulf Boulevard. Big Kahuna�s Water and Adventure Park offers 40 different play areas. Enjoy the giant wave pool or relax in the easy-goin� Lazy River. Scream down the 5-story Jumanji, or scream along the Maui Pipeline. Fly the Skycoaster and play miniature golf. Daytime or evenings. This is where Destin comes to play! In sync with the Navarre Fishing Rodeo, October 1st ant 2nd is also Fish Navarre Weekend! Enjoy FREE pier admission October 1-2 and 10% off all annual fishing and walking passes! If you are interested in paddle boards, scooters, bikes, etc we are also partnering with Sage Paddle CO (which is located directly in front of the RE/MAX building!) They are also doing 10 % off for our guests as well! If interested please contact Sage at (850)396-3044. We will give you the promo code to receive this 10% off upon arrival. The Pensacola Bayfront Stadium is considered one of the premier facilities in Minor League Baseball and home to the Cincinnati Reds Double-A Affiliate. The stadium was designed by Populous (formerly known as HOK Sport), which is renowned for creating many outstanding sports facilities. With a seating capacity of 5,038, Pensacola Bayfront Stadium consistently hosts large crowds throughout the Blue Wahoos season. The stadium also provides one of the best views in sports, with the scenic Pensacola Bay beyond the outfield walls, creating a unique backdrop.